Well, it's not Friday anymore, but here is a photo. Friday was a good day--we closed on our place and got everything moved off the truck. Now, we just have to unpack the many many boxes! 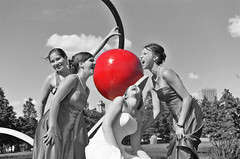 The photo is a shot I took of my sister and her bridesmaids after her wedding a few weeks ago. They wanted it to look like they were all going for the cherry. It took quite some time for me to get them all in the right spot, especially when they kept moving. The others watching from a different position said the girls looked very strange because the perspective was not right to line them up with the cherry.